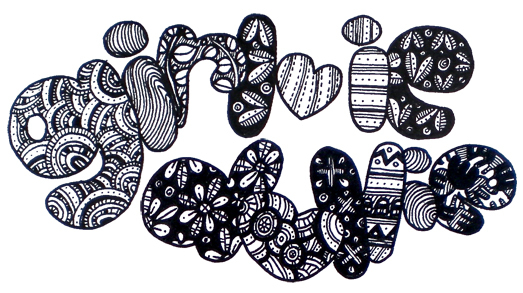 Drawing can be a great fun! But what makes it best is when I am able to draw and dream at the same time. Better still is when I can just immerse myself in it and continues to mesmerize and continue swimming in the dream. Yes, so while busy drawing and dreaming with James’ Lavender Dream Body Scrub..
LOL.. but unfortunately, someone told me they look like rice grains than lavender! Ah!! Need to seriously improve. My first crossover since I start doodling. It’s been a while since I had such adrenaline rush drawing.. yup, the last I had one was probably a year or two ago. Now, I need to work out two piece of artwork. Right, I’m sure you can guess this quite easily.. it’s flowery related! Yup! Rose it is… actually quite my first time drawing rose. And you know what.. it’s grown to be quite addictive. There are really a lot of first time for this project. First time drawing rose.. first time putting details and styling inÂ a flower.. but I am liking it too much already. So much that I am not willing to let it go. You know, there is a part of me who wants to keep all this just to myself. No Mandy! Share.. learn to share and let go! Now,Â may I present you, rose garden. I used to think sleep is a waste of time. Until recently.. I’m so sleep deprived. People ask me what do I do when I don’t sleep. Mmm.. hard to answer, easier to show. LOL.. draw, draw.. draw like there’s no tomorrow! 2012 has come and gone in a blink of an eye. and well… I have survived the Y2K and the predictions of the great Mayans, and what’s next? 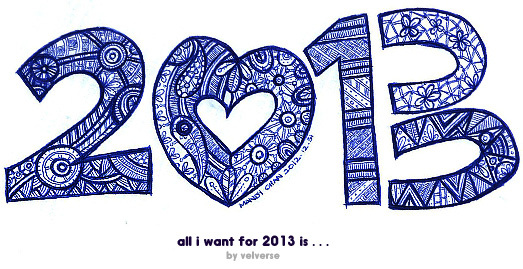 Really, for once… I sat down and really think hard… what do I really want for 2013? 1. Try out more good food. 2. Travel… yes travel more! Ooopss… I think I used the word more again. I mean, I can’t settle for a number although I have hit my quota last year. I really wish I could see the world a little more. Probably this time further away, I don’t know. But weirdly, my heart is thinking Hong Kong. Why? I seriously don’t know… probably I miss the gashapons, probably I just miss the food, probably I just miss those fun travelling moments. But yeah, then again… I’m also thinking of Taiwan… where I am seriously dying to try all the streetfood. I swear, this time round… I am just gonna eat from the beginning of the street till the very end. 3. Work hard, play even harder. Now yes… almost everyone I know say I work too hard. Probably is a sarcastic remark, probably it’s true… but it’s just because I’m incompetent. I just don’t have the skills to do things as fast and good as the others, hence I would really need to spend a little bit more time on it, and step up the game as well. But well, nevertheless… I’m still finding ways to fix it… yes, serious fixing and overhauling! But well, I’ve decided to play even harder to balance up my life. How exactly? I don’t know. I haven’t exactly figure out… probably by eating more good food, travel more? Yes.. pretty much covered on the above pointers. 4. An instagram a day, keeps the memory alive! Yes… a small little side project I’m working on right now… to at least take a photo a day via instagram and at the end of the year, create a wall montage or mosiac out from all the instagram photos I’ve taken. Interesting? Well, I’ve up the level a little… no faces for sure. Yes… it’s just daily photos which represents the day of my life… probably some weird looking photos that doesn’t mean anything… but well… that’s the fun bit of it. And I really wonder, what will my wall looks like at the end of the day! 5. The arty side of me. I’ve been slacking again. I know… right? It’s sad… but sometimes, it’s been difficult and bumpy road. But I’ll still hang on and not disappoint the fire and passion in me. And… at the end of the day, I really need to set my priorities right. The path I choose and the dream I dreamt about… it’s gotta start somewhere… and I guess it’s gotta start here. 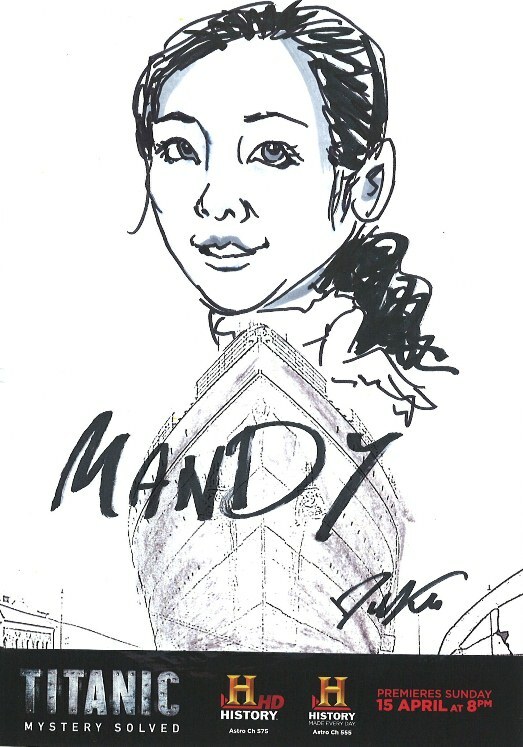 Draw mandy chan, draw! 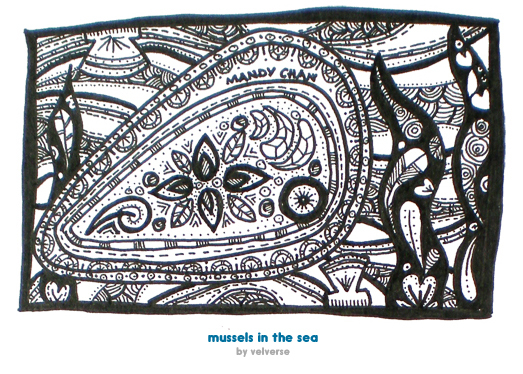 Draw and chase after the infinity canvas! Haha… This is beautiful, no? 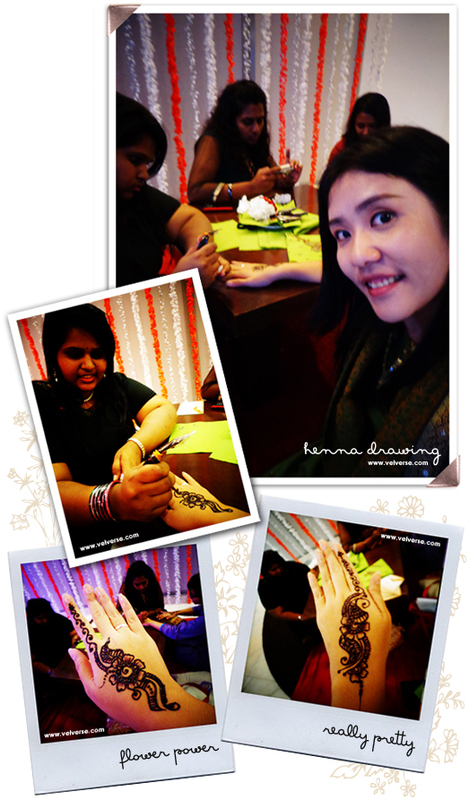 My first time having henna on my hand. 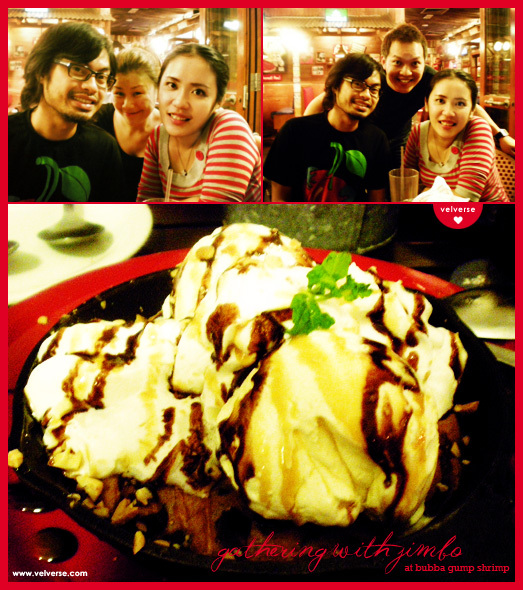 I totally love.. love love.. it. Mmm… a small little doodle I did after a long while. Yeah, inspired by the food I had earlier. 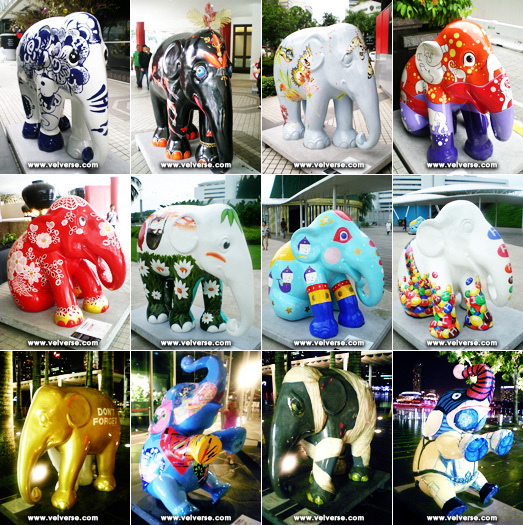 I saw some pretty and nicely done up elephants during my few rounds of trip to Singapore. Yeay! 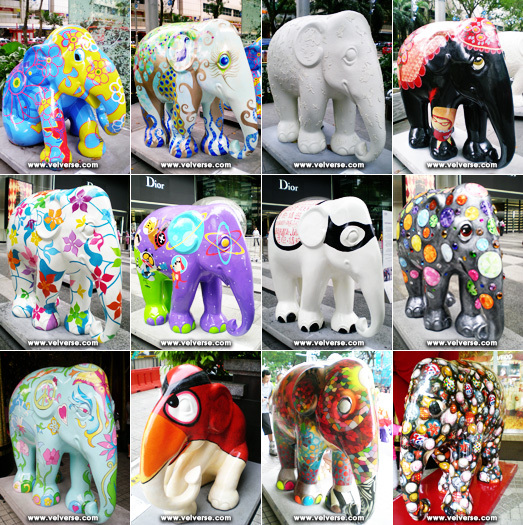 I’m glad I did manage to join in the Elephant Parade. I wish someday I can create one pretty elephant like what the rest of the artist. 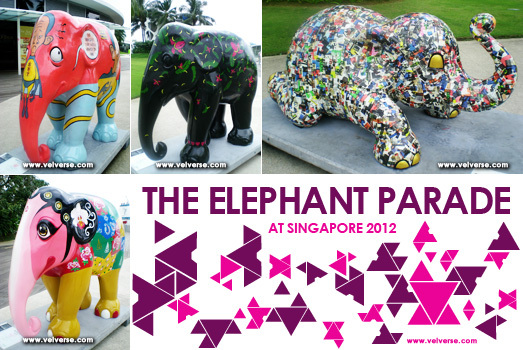 All this elephants are located all around Singapore. Wooohoo… Bubba Gump Shrimp with Jimbo. And… I’m on the TITANIC! I never want to grow up. Maybe cause I didn’t really get to play with much dolls and toys when I was a kid. So now, I still have a kid-ish side in me. 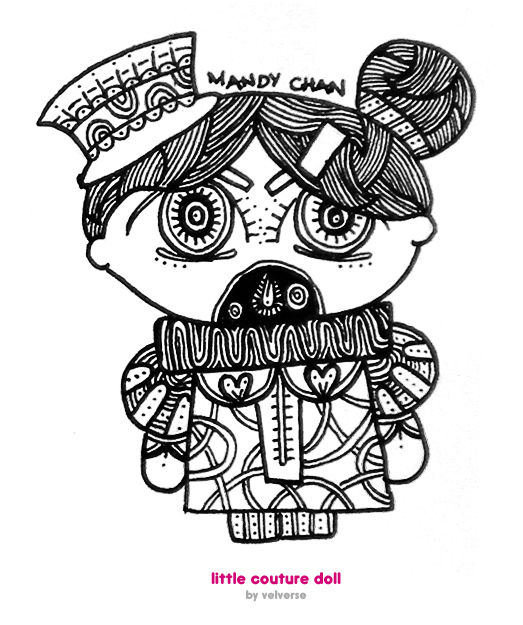 This is my very first version of my Girl.ie Dollie collection. Weirdly, this doll was inspired by many many different things. The dress was inspired by the old french style clothings which I really like. I love how the lace ruff which manages to create a dramatic look.